The last two posts were quite negative in many ways. Let’s move on to something positive, and talk about balance. How often do you see “positive” and “balance” in the same sentence? This is not your usual balance post. Balance is not simply about keeping the win rate at 50%. Starcraft is a game of asymmetry, and hence, the races should be diverse to begin with. Balance is much more than trying to add or remove something from a scale to ensure it is balanced. 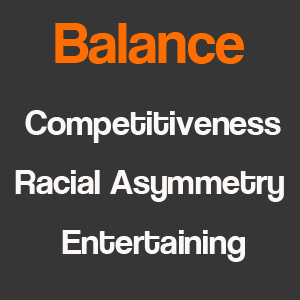 I prefer to conceptualize balance as a multi-dimensional concept, which consists of “competitiveness”, “racial asymmetry” and “entertaining”. By competitiveness, I refer to the game’s design to differentiate players by their skill differences. An eSport game can only be competitive if the better player wins most of the time. No one finds a game which is heavily dependent on luck competitive. In order to make a game competitive, it needs to have a reasonably high skill ceiling. Blizzard do not hide their intentions to make changes which can differentiate players by their skills. This is evident in their recent proposal to increase Oracle’s movement speed. Overall, we feel these changes will help the Oracle become more core to the game, and give players a lot more to analyze during games in which Protoss players make use of Oracles. Our hope for the Oracle is that it will be a unit that greatly rewards players who micro really well. As for Heart of the Swarm, players have better scouting options in the early game. The new Reapers and hallucination changes make it harder for players to hide information from the opponent, and indirectly discourage early game cheese. The game length now tends to be longer than Wings of Liberty. When the game gets longer, the better player usually prevails. Thus, the new changes are improving the competitiveness of the game. I like asymmetrical games like Trading Card Games. I remember Mike Morhaime once said in an interview that Blizzard adapts the idea of asymmetry from Magic: The Gathering in the design of Starcraft. From a social science perspective, it gives the players a sense of social identity within the community. It creates rivalry and community discussion (more of whining, I guess) which benefits the game in general. Also, as I have suggested above, players can reduce their pain by simply labeling racial imbalance as the reason for their defeats. This indirectly makes the game more “rewarding”. Blizzard did a marvelous job for Starcraft II in terms of racial asymmetry. The basic mechanics of each race are diverse enough that each race has its own personality, yet there is no “best race”. If you compare Starcraft II with Warcraft III, you can see that Starcraft II has come a long way in terms of racial asymmetry. In Warcraft II, the production facilities of each race produces like Terran does, whereby the units walk out from the buildings. And every race can repair too, just to list another example. I really appreciate the racial asymmetry of the basic mechanics in Starcraft II. It is extremely difficult to maintain racial asymmetry while ensuring that the game is “balance”. To be fair, Blizzard did a great job in this too. One thing I really like about their approach is that they do not rush. For example, when Heart of the Swarm was just released, everyone just went crazy about the [im]balance of Widow Mine. Blizzard smartly acknowledged the imperfect state of the game back then, but did not make any patch. As the time went by, players came up with new strategies and adapted to the game. It is amazing that the current state of the game is so different compared to what it was a few months ago. If Blizzard were to act every single time when the community calls for it, you won’t see much innovation from the players. Furthermore, a change which is intended to improve a match up could upset the balance of another match up. Blizzard demonstrated how to make changes which will only have the intended effects in the latest patch. The spore crawler only affects ZvZ as intended, but not other match up. Good job. Entertainment is perhaps the most important element for the survival of an eSports game. The eSports industry is an entertainment industry after all, so are other mainstream sports. When Starcraft II: Wings of Liberty was released, the development team had been emphasizing that they wanted it to be a spectating sports, that is, it is fun to watch. I think they have been quite successful as my girlfriend, who only has handphone gaming experience, finds it more interesting to watch Starcraft than other mainstream eSports games. The Medivac’s new speed boost ability has received much criticism from the community and players. Instead of suggesting how to make changes to the Medivac, David Kim highlighted that the Medivac is doing what it is intended to do. And most importantly, it makes the game fun to watch. So from a traditional “balance” perspective, David Kim’s response was absurd. How can you just make the game fun to watch and let the a race has an advantage over another (if there is any)? Blizzard’s stance is that it is not simply about keeping the match up balance, but it has to be entertaining for the spectators too. Of course, I believe the balance team will act accordingly if Medivac is indeed problematic. Another key aspect of keeping the game entertaining is that the game evolves constantly and players are willing to try out different strategies. Blizzard have been actively promoting a more diverse game play, for example, they added the Oracle in Heart of the Swarm to encourage players to use Stargate tech which was underused in Wings of Liberty. Blizzard ensure that every unit has its purpose and is worthy to produce in the game. Again, if you compare it the Warcraft III, you will realize that every unit in Starcraft II is useful in its own way, and has its place in different match ups and purposes. This plays a big part to keep the game fresh for the players and spectators. Like I said, this is not your usual balance discussion. I really appreciate the improvement that Blizzard have done throughout the years in terms of game design and balance. So I want to shout out to the game development and balance team here. Well put, and agreed on all counts. I would love to see your take on the comparison between Warcraft III and Starcraft II. I know both games well. Can you imagine Starcraft II, exactly as it is, but with heroes that level up when they are near units that get killed? That’s not the only difference between the games, obviously, but it is pretty mind-blowing to consider just how different they are. Where should I start? Let’s start by how well designed Warcraft was. I think Warcraft III was very well designed. It was really innovative to combine RPG with RTS. Blizzard did well to balance the impact of the heros by “restricting” the number of non-hero units players get. Instead of criticising heros being too strong, I believe the heros are strong enough to make it a unique blend of RTS game. If heros are just slightly better than the rest of the units, players will eventually spam productions like Starcraft, and that isn’t what Warcraft III is about. In line with this thought, the two main resources are swapped. A maximum (at optimum rate) of 5 workers are mining from one mine in Warcraft III, which indirectly disallow players to mass produce. In Starcraft II, the limit was set on gas instead. You need lumber to build the main building in Warcraft III, and that also forces the game to be hero oriented. Broodwar lovers hate the Warcraft like football lovers hate basketball. Just a different game for people of different preferences. I love both. However, I don’t like Warcraft III for being too inflexible. By that I mean, your build and reaction. Look at WE.Sky for example. He had one best strategy against a specific race on almost all maps (dependent on the ease of getting an early expansion) until it was defeated. From the opponent’s perspective, there really isn’t much you can react to it. You know it is coming, but the variables in the game are too fixed for you to make changes to deal with it. That is where Starcraft shines, and that is why Starcraft is more popular as an eSports. Players do not do the same thing for a year. It is more entertaining to watch for this simple reason. In sum, I think Blizzard have a clear picture of how they want the games to be played. So again, credit to them. Just in case you think I’m a mindless fan, I must tell you that I still hate the way they implement WCS 2013 (mainly on their poor execution and not the idea per se). Anyway, I don’t like the role of Mothership Core, because it is too hero-esque. Not simply because it’s a unique unit, but the impact of it.